Before Walt Disney World came to the area in the 1970’s, Orlando was a sleepy town with an economy based on citrus and cattle. Starting with the clandestine 1965 purchase of forty-three square miles of farmland southwest of the city and the opening of Walt Disney World in 1971, the city has become a major tourist destination and entertainment center. It is so much a tourist attraction, and known so well for its tourist venues, that evaluating it as a place to live is a challenge. A variety of activities and attractions have been built around the Disney complex, and in areas nearby (mostly south of town). The area plays host to some 50 million tourists each year, and has also developed a convention industry second only to Las Vegas. The good news is that most of the tourist activity is confined to the that south and southwestern portion of the city. Kissimmee is part of this explosion south, and is strongly connected to the tourist industries, but it has a nice small and historic downtown area. Downtown Orlando and areas north and east of the city support a fairly normal Florida way of life. Lots of retirees, families and working professionals gravitate towards Winter Park, Maitland and other suburbs north. The employment base in the area outside of tourism is relatively strong, with a large high-tech and military high-tech presence. Notable employers include IBM, Siemens, Veritas, Electronic Arts, General Dynamics, and Northrup/Grumman. The area has also become a popular headquarters location for service businesses, including restaurateurs Darden, Hard Rock Café and Ruths Chris Steakhouse. Overall the employment base is becoming more diverse. 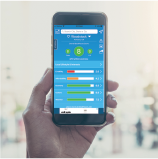 The cost of living and housing has risen considerably in recent years but is considered by many to be reasonable for a place with so many amenities, The central location and transportation network give excellent access to other areas in Florida, and air service is excellent. Orlando has grown very rapidly since Disney arrived, resulting in considerable sprawl. The area continues to grow to the northeast towards Sanford and Deltona. Traffic can be bad and commute times long. The crime rate is also one of the state’s highest. Because of its inland location the Orlando area is generally thought to have less hurricane risk. The flat area is a mix of open land and mostly deciduous woods surrounded by lakes. The fertile terrain is suitable for orchards and citrus crops. The climate is subtropical with inland and marine influences. Summers are warm and humid but temperatures over 95 are rare and breezes provide comfort. The rainy season extends from June through September, with scattered showers and thunderstorms almost daily. Winters are mild with light rainfall. Although not a great threat because of the inland location, hurricanes can create heavy rains. #5 High Gas Prices - Which Cities are Hit the Hardest? The median home price in Heathrow is $487,300. Browse Homes in this Range. 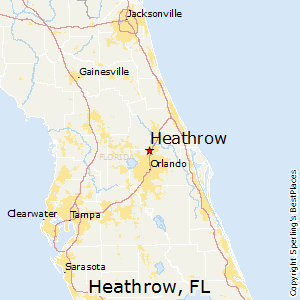 Compare Heathrow, Florida to any other place in the USA.